Description The unfortunate victim of a frightened city desperately in need of a scapegoat. 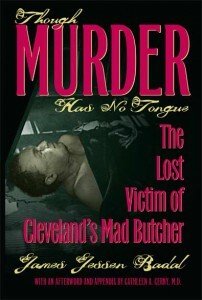 Though Murder Has No Tongue tells the story of Frank Dolezal, the only man actually arrested and charged with the infamous “Torso Murders” in Cleveland, Ohio, during the late 1930s. Dolezal, a fifty-two-year-old Slav immigrant, came to the attention of sheriff ’s investigators because of his reputation as a strange man who possessed a stockpile of butcher knives. According to rumors, he threatened imagined transgressors and had a penchant for frequenting bars in the seedy neighborhood where the dismembered bodies of victims had been discovered. Dolezal was arrested in July 1939 and never saw freedom again. Convinced that they had captured the “Mad Butcher of Kingsbury Run,” sheriff’s deputies interrogated Dolezal for two days under harsh conditions. Sheriff Martin O’Donnell called a press conference and announced that the long hoped-for break in the torso killings had finally come: Dolezal had admitted to the January 1936 murder and dismemberment of Flo Polillo, one of the early victims of the Mad Butcher. During the next six days, Dolezal was questioned further, given a lie detector test, beaten, and generally mistreated. Ultimately he was arraigned on firstdegree murder charges that were quickly dropped because he was denied legal representation. At his second arraignment in July, Dolezal was bound over on manslaughter charges. Within a month, he was dead—found hanged in his cell. His mysterious death was ruled a suicide. But was it? In Though Murder Has No Tongue, James Jessen Badal tells a gripping tale of justice gone wrong. It is also a modern story of forensic analysis as compelling as an episode of CSI. Using police and sheriff reports, inquest testimony, autopsy and archival photographs, unpublished notes from the primary investigators, and analyses from some of today’s top forensic anthropologists and medical examiners, Badal establishes the facts, dispels rumors, and presents a thorough examination of the real reasons behind Frank Dolezal’s mysterious death. James Jessen Badal is assistant professor of English and journalism at Cuyahoga County Community College in Cleveland. He was elected to the board of trustees of the Cleveland Police Historical Society in 2001. He is the author of In the Wake of the Butcher: Cleveland’s Torso Murders (The Kent State University Press, 2001) and Twilight of Innocence: The Disappearance of Beverly Potts (The Kent State University Press, 2005).